To Cite: Zakerkish M, Amiri F, Majdi Nasab N, Ghorbani A. 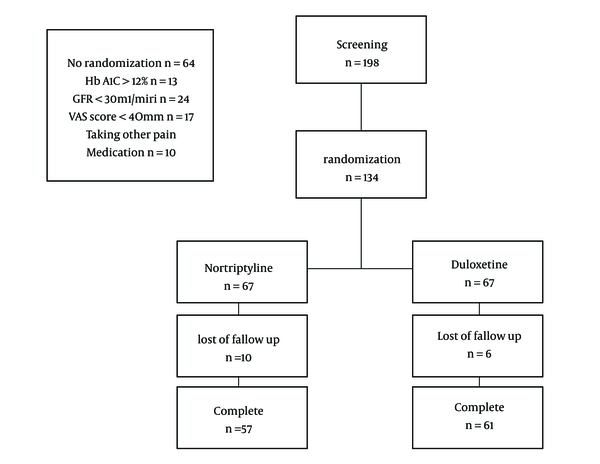 Comparative Efficacy of Duloxetine Versus Nortriptyline in Patients with Diabetic Peripheral Neuropathic Pain: A Double Blind Randomized Controlled Trial, Iran Red Crescent Med J. 2017 ; 19(8):e59995. doi: 10.5812/ircmj.59995. Background: Diabetic peripheral neuropathic pain (DPNP) is a common type of diabetic neuropathy. Blood sugar control is the first step for management of DPNP and drug treatment may be prescribed for the pain relief. Objectives: This study assessed the efficacy and safety of duloxetine and nortriptyline in patients with DPNP. Methods: This double-blind randomized clinical trial was conducted in the diabetes clinic of Golestan Hospital (Ahvaz, Iran). Convenience sampling and simple random allocation were used in the study. 134 patients with DPNP were randomly divided into two groups (67 patients in each group). The duloxetine group received 30 to 60 mg/day and nortriptyline group received 25 to 75 mg/day for a period of 6 weeks. Pain assessment was conducted based on a Visual analogue scale (VAS) and drug side effects were assessed on a weekly basis. Results: The study showed that both groups had significant reduction in pain severity at the end of the study (P < 0.05). The proportion of patients achieving 50% reduction in pain severity was significantly greater in the duloxetine group than the nortriptyline group (P < 0.05). The treatment side effects observed in the two groups were not significantly different (P = 0.298). Conclusions: Monotherapy with duloxetine and nortriptyline is safe and effective in the management of patients with DPNP. Peripheral neuropathy is common in diabetes mellitus that is observed in 30 to 50% of the patients (1). The lack of sense is starting in the toes and progressing proximally is just glove and sock distribution. Approximately 10 to 20% of patients with diabetes have DPNP that worsens at night (1, 2). Diabetic peripheral neuropathy is diagnosed with pain feeling in lower extremities in diabetic patients (3). However, other potential causes of peripheral pain including vitamin B12 deficiency, claudication, and osteoarthritis should be considered (4). Neurological evaluation, such as quantitative sensory tests and nerve conduction velocity (NCV) can help make the diagnosis (5). Several guidelines on the treatment of neuropathic pain, especially diabetic neuropathic pain, have been published (5). Although some of these drugs are anticonvulsants or antidepressants, the pain relief they provide is not associated with their main role (5). DPNP causes significant distress to the affected patients. As treatment options increase, selecting the best drug for a given patient becomes more challenging. In choosing a regimen for the control of DPNP, the physician must be aware of not only the benefits of the medications but also of the potential side effects (6). Although traditionally the first step in the management of DPNP has been to improve and stabilize glycemic control, additional drugs are usually required (7). The combination of pharmacological treatment and non-pharmacological therapies should be used to control the symptoms (8). A variety of effective treatments are available for DPNP, including Tricyclic antidepressants (TCAs) (amitriptyline and nortriptyline), Anticonvulsants medications (Pregabalin, Gabapentin), serotonin-norepinephrine reuptake inhibitors (SNRI) (duloxetine, venlafaxine), opioids and medications like opioid (tramadol or oxycodone) and topical medications (lidocaine patch, capsaicin cream) (9-12). Non-pharmacological therapies for DPNP are acupuncture and transcutaneous electrical nerve stimulation (TENS) that acupuncture is most supported by research (13, 14). Among the medications to treat DPNP, TCAs are most strongly supported by studies. Certainly, if there are no contraindications to their use and the patients can tolerate it, they should be the first oral drugs prescribed. However, many patients, especially the older ones, cannot tolerate the antihistaminic and anticholinergic effects of TCAs. The physicians generally do not try TCAs for patients older than 50 years even if there are no contraindications (5). The most common side effects of TCAs include dry mouth, sedation, weight gain, urinary retention, orthostatic hypotension, and arrhythmias (15). All the TCAs appear to have the same effect on pain relief; but some of these drugs such as desipramine and nortriptyline have fewer antihistaminic and anticholinergic effects than amitriptyline (5). Studies indicate that neuropathic pain is associated with an unbalanced release of serotonin and norepinephrine from neurons. SNRIs are a promising category of antidepressants for treatment of DPNP. They have fewer drug interactions and they are better tolerated compared to TCAs (16). Duloxetine is a relatively balanced dual reuptake inhibitor of both NE and serotonin that has analgesic and antidepressant effects (17, 18). Duloxetine is approved by the FDA for the treatment of DPN (17). The most common adverse events among duloxetine-treated patients are nausea, dry mouth, headache, and dizziness. In order to reduce side effects of drugs, treatment begins with a low dose and then the dose will increase to the therapeutic dose if the patient tolerates the initial dose (19). No direct head-to-head comparison has been conducted between duloxetine and nortriptyline for the treatment of DPNP. Therefore, this research was performed to compare the safety and efficacy of duloxetine and nortriptyline in patients with DPNP to provide a favorable treatment option for these patients. This randomized clinical trial was conducted to compare the efficacy and safety of duloxetine and nortriptyline in patients with DPNP. The informed consent was obtained from the patients before the study. This study was registered in Iranian registry of clinical trials (IRCTID: IRCT2016031927107N1). The inclusion criteria were pain related to diabetic neuropathy based on history, clinical examination, NCV, and Michigan neuropathy screening instrument (MNSI), pain score of at least 40 mm on the 100 mm VAS, patients older than 18 years, duration of diabetes > 1 year, and HbA1C < 12%. Patients with hepatic, renal failure (GFR < 30 mL/min) or cardiac failure, patients who were taking other drugs for the management of DPNP two weeks prior to the study enrolment, patients with contraindications to the trial medications, patients with neuropathy due to other diseases, patients who did not complete the application form, and lactating or pregnant women were excluded from the study. Patients could continue their regular medication if there were no interactions with the trial drugs. Patients who met the study criteria were randomized by computer into the two groups and they randomly received either one of the drugs as follows: 1) nortriptyline 25 mg/day up to 75 mg/day and, 2) duloxetine (DLX) 30 mg/day up to 60 mg/day. To control selection bias, block random allocation with 33 blocks sized four persons for each block repeating twice the words of A and B was used. Block number selecting was conducted randomly by statistical package for the social science (SPSS) 22, and afterward the subjects were randomly allocated into two groups. To blind participants assignment, blocks size was not announced. All participants were selected from a private diabetic clinic and they were not referred from other clinics or health centers; they were personally admitted for the first time. Patients were followed up weekly for six weeks. The efficacy parameter was reduction in severity of pain rating recorded by patients in daily diaries using 11-point VAS (0 = no pain to 10 = worst possible pain). The weekly mean VAS score for pain was calculated for each patient. The reduction of the mean VAS score from baseline to 6 weeks post treatment was considered as the endpoint. The study endpoint considered for analysis was measured at the completion of one week over six consecutive weeks. The safety of study medication was assessed in all patients by recording adverse drug reactions as reported by them. A questionnaire was developed including five parts: A: demographic characteristics; B: MNSI score; C: NCV result; D: laboratory data (when they included in the study); and E: VAS score on weekly visit. To assess validity of the checklist, content validity index (CVI) and content validity rate (CVR) were calculated and the obtained values were 0.83 and 0.98, respectively. Cronbach’s alpha was applied to assess the reliability of the questionnaire and the obtained value was 0.921. Data were reported as mean (standard deviation) and frequency (percentage) for quantitative and qualitative variables, respectively. The Kolmogorov-Smirnov test was used to evaluate data normality (normal distribution of quantitative variables). To compare the qualitative variables between the groups, Chi-square test and exact test were used. To compare the quantitative variables between the groups, t-test was used in the case of normal data; otherwise, Mann-Whitney test was applied. Data were analyzed using SPSS22 at significance level of P < 0.05. Of the 198 patients screened, 134 were randomized to receive either nortriptyline or duloxetine. At screening, 64 patients failed due to inadequate pain score (17), using other medications for pain relief (10), GFR < 30 mL/min (24), and hemoglobin A1c > 12% (13). Patient disposition is shown in Figure 1. The mean age of patients was 53.39 8.62 years and the majority of patients had type two diabetes (90.29%) with mean duration of diabetes of 10.58 5.85 years. Most of the patients in both groups were women (53.73% in the nortriptyline group and 62.7% in the duloxetine group). The medication for glycemic control was oral agent in 52.2% of the patients and insulin in 47.8% of the patients. The baseline clinical and demographic characteristics of the two groups were similar and no significant differences were observed between the two groups (P > 0.05). The patients' demographics and baseline characteristics are shown in Table 1. Both treatment groups experienced a significant reduction in pain score (VAS) at the end of the study (P < 0.05). Of the nortriptyline and duloxetine groups, 75.5% and 98.4%, respectively, had a 30% improvement in pain scores at the end of the study and there was no significant difference between them (P > 0.05). The response rate of 50% pain reduction was 26.31% by nortriptyline and 60.65% by duloxetine that showed a significant difference between the groups (P < 0.05) (Table 2 and Figure 2). There was no significant interaction between the patients demographics and the response rate of pain reduction (P > 0.05). 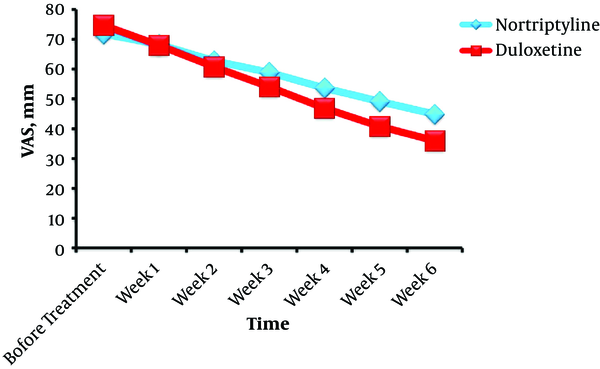 Treatment adverse events were generally higher during the first week than the second week. There was no significant difference between the two groups in terms of adverse events within each week (P = 0.298). 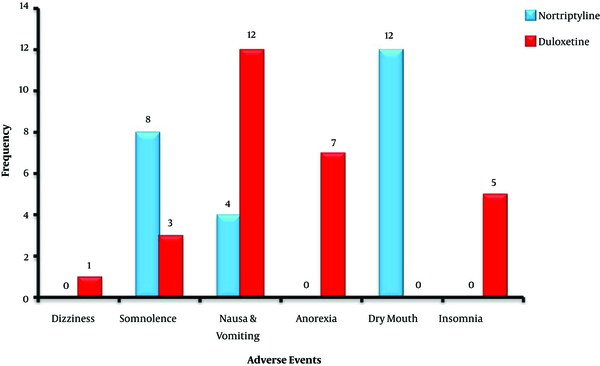 The adverse events were nausea, vomiting, anorexia, dry mouth, somnolence, and dizziness; they were self-limiting, mild events that did not require the discontinuation of treatment (Figure 3). Figure 3. Frequency of Adverse Events Associated with Treatment (There Are Not Significant Differences Between the Two Groups, P = 0.298). 16 subjects discontinued due to the unknown reasons (6 from the duloxetine group and 10 from the nortriptyline group) in the second and third weeks. The pain severity reduction that observed in this study is similar to the previously reported results that duloxetine and TCA were effective in the management of DPNP. In a clinical trial, Kaur et al. showed that treatment with duloxetine was effective as treatment with amitriptyline in reducing pain related to DPNP. The response rate of 50% pain reduction was 55% by amitriptyline and 59% by duloxetine that showed no significant differences between the groups (P > 0.05) (22). The efficacy of duloxetine for DPNP-related pain has been observed in three double blind, placebo-controlled, randomized studies (Raskin et al. 2005; Goldstein et al. 2005; Wernicke et al. 2006). These trials demonstrated significant improvement (P < 0.001) at the end of the study in pain dairy measures and BPI scales compared to the placebo group (18, 23, 24). Quilici conducted a meta-analysis to assess the tolerability and efficacy of DLX, PGB, and GBP in patients with DPNP. Six studies of PGB, three of DLX, two of GBP, and none of AMT fulfilled the inclusion criteria. Among a number of available trials that were favorable for indirect comparison, DLX showed comparable efficacy and tolerability to GBP and PGB in DPNP. Duloxetine is an appropriate treatment option for pain relief (25). In a double blind, randomized, parallel group, Boyle et al. investigated diabetic subjects with DPNP and showed that all medications (duloxetine, amitriptyline, and pregabalin) reduced pain compared to placebo, and none of the drugs were superior. No significant difference in clinical efficacy was observed between amitriptyline, duloxetine, and pregabalin. There were no significant safety results; however, in the pregabalin group there were a significantly higher number of adverse events (26). In a clinical trial, Tanenberg et al. investigated three groups of patients with DPNP: duloxetine, pregabalin, and duloxetine plus gabapentin recipient groups. Duloxetine was noninferior to pregabalin for the treatment of pain in patients with DPNP (27). In this study, the patients sample was limited due to the exclusion of patients whose concomitant medications and comorbid conditions might have interfered with interpretation of safety or efficacy; thus, more study will be needed to generalize these results to all patients with DPNP. In addition, it requires assessment for a longer duration than the 6 weeks. We did not have a placebo group in this study. Strengths of the current study include the use of nortriptyline that has fewer anticholinergic and antihistaminic effects than amitriptyline. Most of the patients with DPNP are old and there is concern regarding treatment adverse events. This trial demonstrates that nortriptyline is effective in managing DPNP. The suitable criteria for inclusion in this trial were pain related to diabetic neuropathy based on multi factors: history, physical examination, MNSI, and NCV. Monotherapy with nortriptyline and duloxetine leads to a significant reduction in pain severity with mild side effects in patients with DPNP. Duloxetine was more effective in 50% pain reduction than nortriptyline; therefore, it is suggested that duloxetine may be a beneficial treatment for patients who require further reduction of pain. However, more studies with larger sample sizes and longer durations are needed to confirm these results. We kindly appreciate the contribution of all participants and the personnel of Golestan Diabetes Clinic.